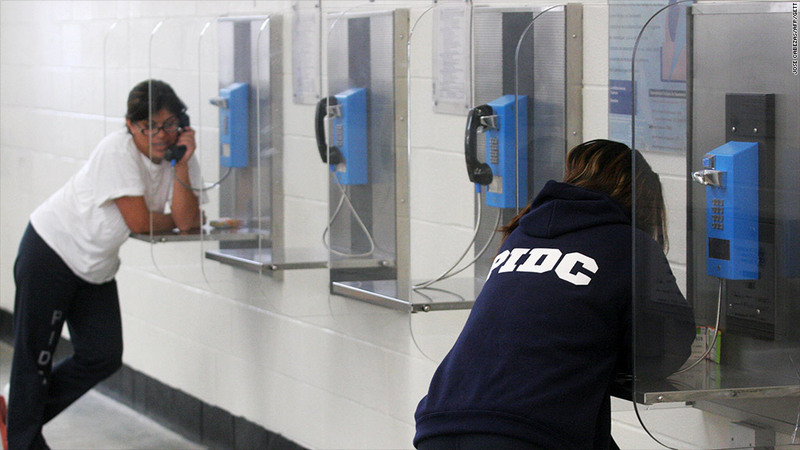 The FCC unveiled a plan to bring down exorbitant rates for phone calls from behind bars. For millions of prisoners, placing a call home means paying exorbitant rates that can exceed $1 a minute. Now, federal regulators have moved to ease the burden. Three commissioners with the Federal Communications Commission voted 2 to 1 Friday to reduce the rates inmates and their families pay for interstate calls from prison, a measure long demanded by civil rights groups. It will take about 120 days for the new rates to take affect. The commissioners voted to impose a cap of 25 cents a minute for a collect call, and 21 cents a minute for a debit or prepaid call. That is less than one-fourth the current rate in some locations. "This is a means to help strengthen families," FCC Acting Chairwoman Mignon Clyburn told CNNMoney before the vote took place. "Communication is key, particularly when families are separated." In the months to come, Clyburn said the FCC could issue new regulations on whether caps should be applied to calls made within state boundaries. The proposed changes have been in the making for months, as the FCC moves to break up what it refers to as a monopoly of prison phone service companies charging exorbitant rates. The reforms would still allow service providers to make a profit, according to the FCC. The top providers are GTL, Secururs, Pay-Tel, Telmate and CenturyLink (CTL). Jeff Hansen, chief marketing officer at Telmate, declined to comment immediately after the vote but in an interview prior to the vote, he said rates should be "accessible for inmates and their families, [but] the question is what level is fair is reasonable." The FCC's vote comes more than a decade after a U.S. District Court dismissed a class action lawsuit led by Martha Wright of Washington, who said that she paid $1,000 per year to cover the costs of her grandson's phone calls from various state prisons. The judge referred Wright to the FCC. -- CNNMoney's David Goldman and James O'Toole contributed reporting.